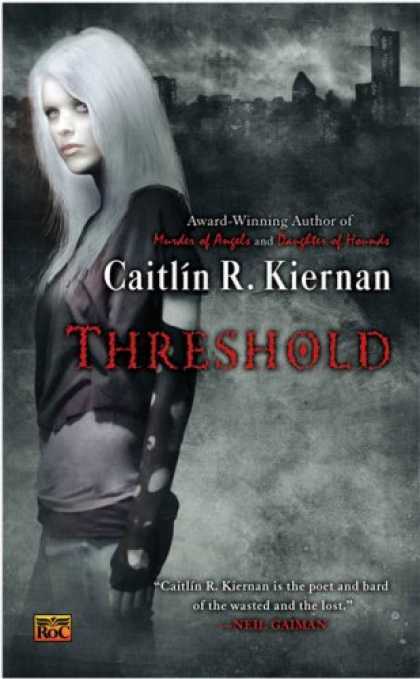 I mentioned in a couple of posts back that I was reading Threshold by Caitlin R. Kiernan and I was enjoying it, but it turned out to be one of those books where I respond with an “Ok then…” and put the book down with great uncertainty. Well, apart from the grammar and sentence structure, this book showed promise. I love the details and wording she used and it left me wondering what she would be like as a poet. There is a lot of dark content in there, in the descriptions, and in the subject. The story deals with a lot of death and at some point the characters get quite confused (or just start going mad) making you wonder what the hell is going on and what is up with these characters. You have the drunken guy who drowns out his demons, the woman who explains everything away with science, the Goth girl who is damaged only because she wants to be damaged, and then the albino girl who shows up sprouting nonsense about monsters and things that just don’t make sense. There was also no romantic interest in sight and for someone who is an old horror buff, but has been reading novels where the vampires are all love sick morons who whinge, it was a really nice change. The monsters in this story are actual monsters. So I’m getting into it and then we come to the chapter at the end. I’m not going to give away spoilers, but I didn’t really see it coming. It was like she completely broke off onto a different tangent and then left it at that without an explanation. Which I don’t mind to an extent because some stories just shouldn’t have explanations, but it also driving me nuts because I want to know why it started or how it fits with the story. It had a classic what the f*ck ending really, but at the same time it was an ending that just wasn’t good enough for me, and yet I don’t want to say it was a bad read and I’m even tempted to check out her other books. One other thing I’ll say about it is the science character is a palaeontologist and I think it’s great to see proper descriptions and names used for that character, rather then some slap together job where the character is a palaeontologist, but without the details. You can tell that the author either knows what she is talking about or did some research.